Here are a few tops that are technically done, but I feel like they need more. 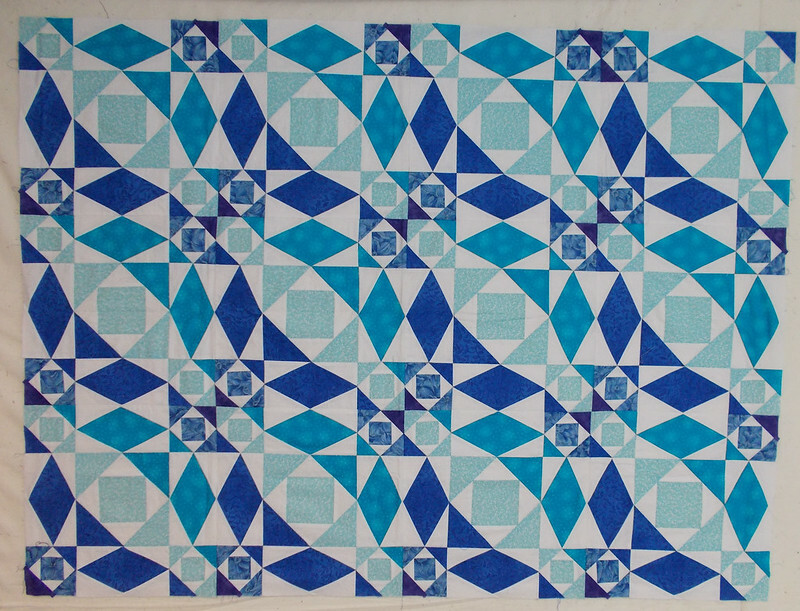 This Storm at Sea quilt is an early project – I probably made this in my first year or two of quilting, and I did it the hard way, by cutting every little triangle then sewing them together. If I knew then what I know now, it would have been a lot less painful, if not any faster. You can read about it here. I am disappointed at how small it is, so even though it looks like a finished top, I want to do… something. 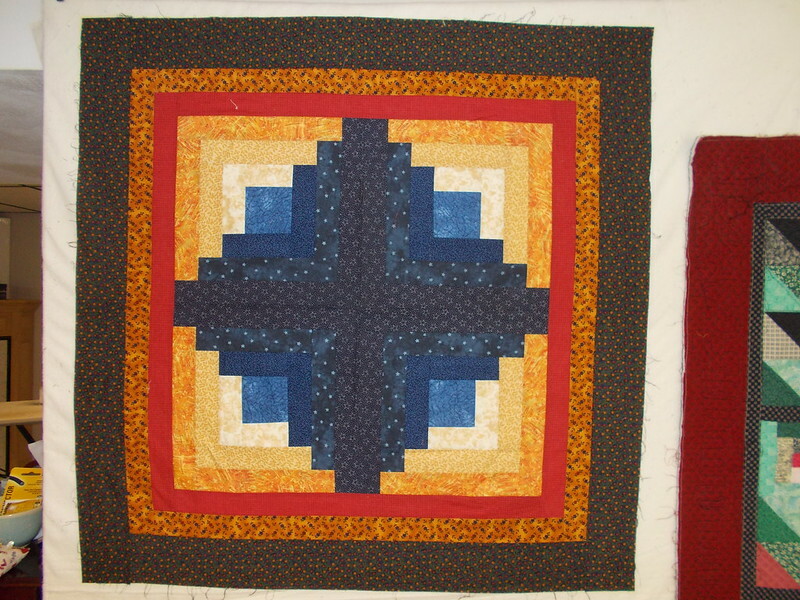 Pieced borders, or more blocks, I’m not sure exactly what. I just know it isn’t really finished. it’s kind of ridiculous. The whole thing isn’t very big, maybe 3 feet square, and there’s a lot of flop because my seams weren’t all that accurate. I don’t really like it all that much. This quilt is a real embarrassment. It was made as a gift for my aunt and uncle, both in the school system, many years ago. After I finished it, I realized one block was turned wrong, so I stuffed it away and ignored it. (Because that always works.) I told my aunt about the quilt – I even SHOWED her the quilt top, hoping that would prompt me to finish it. It didn’t. I turned the bad block and stuck it back in a tote. Part of the problem now is that it’s kind of a small lap quilt. One lap only, no foot or chest coverage. It will probably only be decorative, so I suppose I should just get it on the quilt frame and move on. I have a half-embarrassed affection for this poor thing. It’s my very first quilt, made in a class using Alex Anderson’s book Start Quilting (a great choice for beginners). The fabrics are from JoAnn’s calico wall, collected over ten or fifteen years, ending ten or fifteen years ago. They’re painfully dated. I’m pretty proud of my piecing, but I tried quilting it on my regular sewing machine and it isn’t good. It also isn’t finished. I should quilt it, but although I feel some affection for it, it isn’t big enough to use, and it isn’t pretty enough to put on a wall. Well, that ends today’s rummage through the UFO pile. Still more to come – next is my assortment of orphan blocks. Love your Storm at Sea. Maybe donate the small ones to Project Linus or somewhere else as baby quilts? I am reminded of a UFO from very early in my quilting days, around here somewhere stuffed away. I never liked it much (hence its being buried). Now I’m thinking I should find it and bring it back out into the light of day and either finish it up or rework it to where I do like it. If that’s even possible. The Storm at Sea is so pretty! And, oh man – how many times I’ve used that method of dealing when a quilt project has a mistake or a particularly challenging issue – tossing it into a box and shoving it far away where it languishes literally for years. I also can’t count how many times I’ve pulled them back out and either can’t see a single thing wrong with them, or find that the solution is pathetically easy and fast to render. heh! Your Storm at Sea is beautiful. I’m doing one now for a wedding quilt. I can’t wait to see how you decide to finish it. On the pieces you are no longer fond of…donate the tops to be quilted for charity or quilt them yourself and move forward. 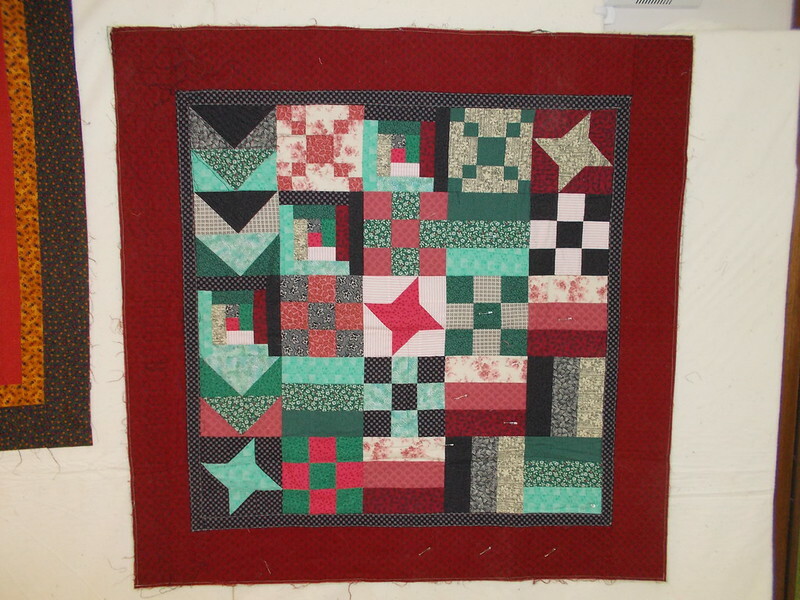 The sampler quilt is sweet. No reason to be embarrassed by where you bought the fabric. I encourage beginners to only spend what they are comfortable in if for no other reason but to lure them into the fold. For a while I worked at Northwest Fabrics and Crafts (I’m not even sure they are still around), but they were a large format chain similar to JoAnns. I’m still finishing quilts that I started using fabric purchased from there over 20 years ago. You are brave enough to share all of your unfinished UFO’s I dare not share mine til I’ve got them done. Thanks for sharing. 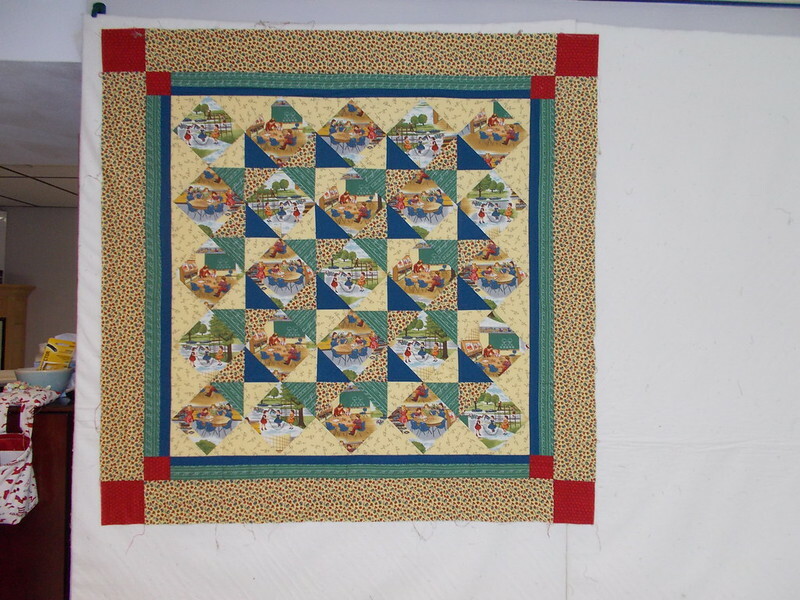 I clicked on your link for the storm at sea quilt and had to smile to see it in your 2008 post with the title “Git er done”. I’m glad I’m not the only one with 10 year old quilts that still need to get done!